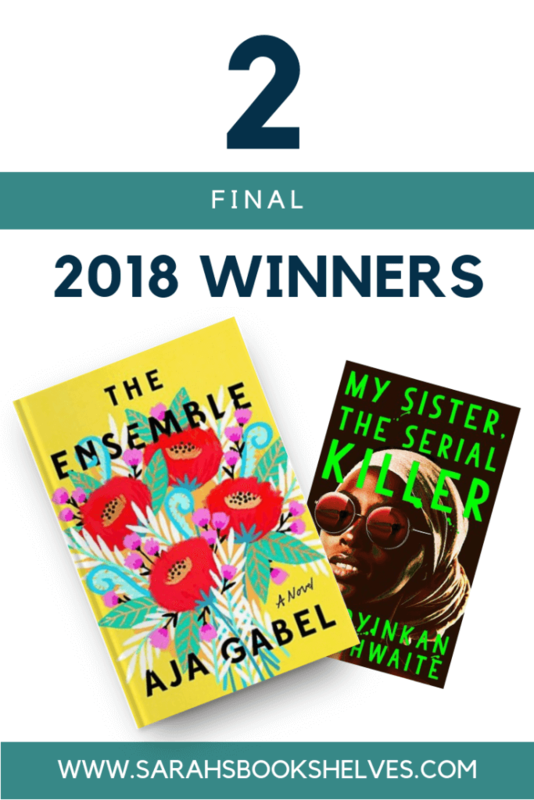 You’re probably wondering why I’m posting something titled “Two Final 2018 Winners” in late January 2019! I read both these books at the very end of 2018…after I’d stopped posting book reviews for the year. But, I loved these two so much (one made my Best Books of 2018 list) that I still wanted to tell you about them! They aren’t quite an Alcohol & Advil pairing, but My Sister, the Serial Killer would make a fun follow-up to The Ensemble. Plot Summary: The story of the Van Ness string quartet…four elite musicians, their rise to prominence in the classical music world, and their relationships with each other. My Thoughts: I was initially super excited to read this book right when it came out based on Annie Jones at From the Front Porch podcast‘s recommendation…then, some other readers I trusted came back with mixed reviews, so I put it off. I’m thrilled I finally made the time because I adored it! It’s one of those character-driven novels where there’s not much action, but completely pulls me in anyway. Gabel opens the book with a chapter that immediately lays out the dynamics between the members of the Quartet…and they are subtly complicated. These people clearly love each other, but you also get the feeling one could kill another in the night. And, that’s what makes this book so engrossing. It’s all about the simmering dynamics of this group and it explores the implications of having an essentially business relationship that supersedes all other relationships in their lives…even the ones that probably should come first (spouse, kids, etc). How do they manage this tension over the course of their lives? And, Gabel’s writing is just gorgeous, especially for a debut novel. If you loved The Interestings (my review), The Ensemble should be next on your list. PS – you do not have to love classical music to love this novel…I no nothing about classical music and don’t particularly care about it either. When you were on your own, in whatever career, whatever you did affected only your own job. But with the quartet, they had to share a goal, distribute the dream between them, and trust that each of them had an appropriate sense of commitment. The commitment had a way of bleeding into their lives off stage, as well. There were so many ways to betray each other. 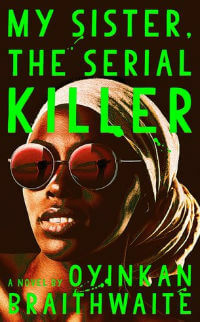 Plot Summary: Korede, the “good” sister, does everything right and always cleans up after Ayoola, the beautiful sister, who sails through life without a care in the world…yet kills her boyfriends and manages to be their mother’s favorite. My Thoughts: The premise of this book is ridiculous in a campy way and specific parts are preposterous, but it works! It’s a story of sibling dynamics…obviously taken to the extreme…but, the underlying point is one many people can relate to. And, it’s weirdly funny…even though people keep dying. Honestly, I picked up this book because of the fantastic title and because it’s so short…but, I couldn’t have been more pleasantly surprised. Despite the murderous title, this one is a fun, light read and would make a perfect palate cleanser! Nice reviews, Sarah. I’m glad you liked The Ensemble so much. I liked it a little less than you, but after reading your review I sort of like it more! And My Sister? Just plain fun in a sick sort of way! Sarah, it pains me to say this but I read The Ensemble this past week and it didn’t work for at all, even though from the descriptions it should have. Haha – I can definitely see how it wouldn’t work for some people. It’s really character-based and the people aren’t super likable and there’s not a ton of action. But, something about her writing style made it for me. I have My Sister… coming up next in my audio queue. If only I can get through Becoming in time to finish this one before my library hold is up! I haven’t heard much about the audio, but I’m hoping this sort of campy, over-the-top type of story works in that format. I like the sound of both. I will keep them in mind in case I encounter them on sale. My Sister… was reviewed by three other bloggers I follow and they loved it. It seems quirky for sure. I really love campy books, and My Sister the Serial Killer looks so tempting! I think I’ll probably give it a try sooner rather than later. It is a touch campy, but not overly so. But, I do think you’ll like it! It’s super short. I loved both of these! 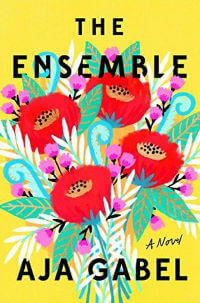 I read The Ensemble in December and unlike you, have yet to write a review about it. Which means I’m forgetting more details by the minute and will probably never write about it. But it was a beautiful book. It was gorgeous! I think I felt I had to write a review b/c A) It was on my BESt of 2018 list and 2) it was an ARC…how could I not review that, but I definitely read it really late!